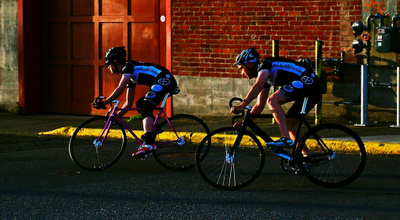 Victoria's shady backstreets are going to get another dose of track bike racing this June, with the inaugural Design District Crit on Saturday, June 23rd. Two races, one fixed-only, the second single-speed specific will run on a fast, .74km course encircling Vic's favorite brewery, Phillips. Similar twilight fixed-gear crits are gaining in popularity globally. The perfect mixture of adrenaline, refreshing beverages, and an irreverent take on bike racing. Our course features a slight rise in the finishing straight, some nasty pavement along the back, and lots of vantage points for voyeuristic spectating. Come down for a film screening and crisp beer before hand, stay for the racing and after party. Of course, you can always sign up to race! More details forthcoming, including a few race warm up nights, and party details.